This will be the first and perhaps the last time the area’s gold standard resort, One&Only Palmilla, allows the general public access to its fabulous annual New Year’s Eve fete. 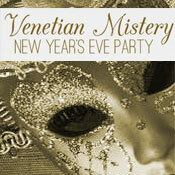 This year, sumptuously dressed and masked accessorized attendees will enjoy a Venetian-themed ball complete with a champagne toast, live music courtesy of a 10-piece band, and a premium cash bar. This entry was posted in Festivities, New Year's Eve, San Jose del Cabo on November 30, 2013 by admin.